On Saturday, July 14, Liberty Village Toastmaster held our annual summer party. With the Olympics coming up in two weeks, what’s a better theme to celebrate than the Olympics? 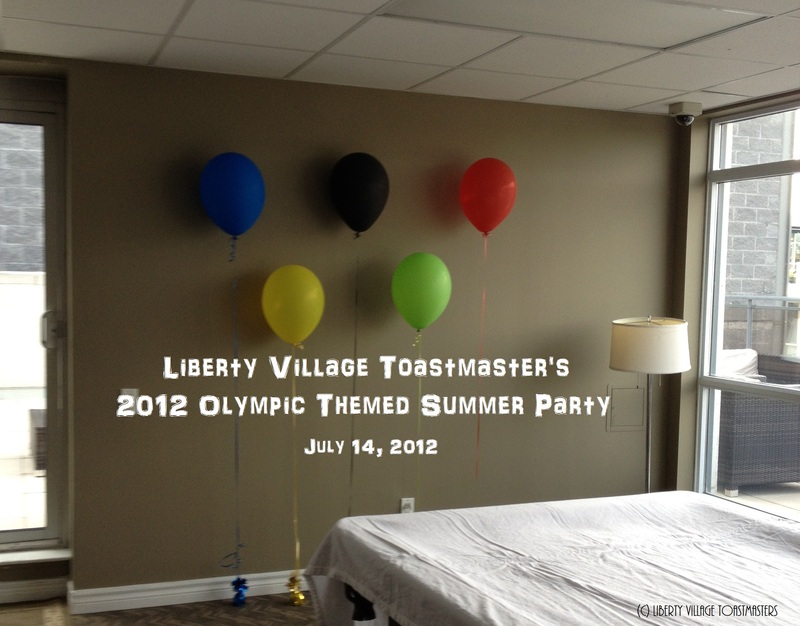 In more ways than one, the Olympics is quite similar to Liberty Village Toastmasters. Can you guess the ways? One, for example, is the fierce (but friendly) competition at our contests, from our weekly table topics contests to our semi-annual contests that our members have competed at district-wide level. Another example is our strong teamwork that scores us awards like Presidents Distinguished Club every year! And don’t forget about our celebrity status, when a few of our members were interviewed with CBC radio earlier this year! These are just three of the many reasons Liberty Village Toastmasters make a winning team! When we first advertised our party, we were worried that not many people could make it, due to the lack of response we’ve been receiving (please remember to check your e-mail inboxes and spam folders for the invite!). However, as we got closer to the date, more and more people began to respond. As a result, we had a good turnout, as expected – approximately 30 people attended: members and a few guests. The party started at 6 PM. Since it was a costume party, people were dressed in all sorts of attire – from soccer and rugby uniforms to cute beach volleyball outfits to coordinated country flag colours! After everyone arrived and settled down, the opening ceremonies began. As this party marks the start of a new term at Liberty Village Toastmasters, the outgoing and incoming executive teams were acknowledged and congratulated. In the Olympics, a torch is passed from one guardian to another to symbolize the passing of the Olympic spirit. Our MC’s Simon and Chan presented an object similar to the Olympic torch: a flaming gavel! With a few proud words from our immediate past president, Sean, this flaming gavel was passed on to our incoming president, Julian, thus passing on our TM spirit! Andrew, our host, prepared and explained the themed cocktail, which featured Pimm’s, a liquer originating from London, England, thus creating our 2012 London Olympic connection. The essence of the fruit, Italian soda, cucumber, mint, and liquer made it taste refreshing and flavourful. To go with this wonderful drink, we provided snacks, catered appetizers, and barbequed burgers, which were all amazing and delicious, so we filled our stomachs to our hearts content! To go with the theme of the party, we divided the group into five teams to play some games. Inspired by the game show “Minute to Win It,” the contestants have only a minute to complete each challenge. The first game requires two players to move soda cans to another table using several spaghetti strands, without hands! The team with the most cans transported wins. The second game have the contestants stack cups as high as they can, the highest tower built within a minute that does not collapse wins. Continuing on with the TM spirit, Simon presented a humorous slide show that compared Olympic moments to Liberty Village Toastmaster moments, ensuing to a slew of giggles! After these Olympic/ Toastmaster moments, dessert was introduced. Among the goodies like cupcakes and cookies, one platter stood out and was eagerly consumed: chocolate fondue with fresh berries! But the party isn’t complete yet! The winners of the Games and the most dedicated Toastmasterian athlete had to be awarded! Sean, Ted, Craig, Arvind, Lorenzo, Vlad, Frazer, Julian, and guest, Vicky, gladly claimed their prizes! Finally, to end the night, we relaxed with playing some billiards, dancing to some music mixed by our wonderful D.J. Rene, and doing what we do best: telling stories, with lots of laughter, of course. Thanks to the party planning committee (Andrew M, Simon, Chan, Kuntal, Rose, Rene, Lorenzo, and Ted) and most of all, YOU, the attendees, for making this event possible. Special thanks go out to Andrew M., for hosting the party and as Simon adds, “being the ‘glue’ of the group”!